Today I am previewing the Virginia Cavaliers. The Cavaliers made it to a bowl game last season but lost to Auburn 43-24. This year the Cavaliers are hoping to build on their 8-5 season in 2011, and Head Coach Mike London seems to be doing a good job. He took his 4-8 team in 2010 and helped mold it into an 8 win team just a year later, and now in 2012 they have a shot at a similar win total. They return their starting quarterback from a year ago in Michael Rocco and he has fresh competition at quarterback now that Alabama transfer Phillip Sims has been added to the fold. Rocco has the hold on the starting job for now, but Sims is a superior talent because of his athleticism and arm strength. Rocco won the job because of his command of the offense, but as Sims catches up to him in that regard it will be hard for London to keep a player with Sims’ talent off the field in my opinion. The competition in the 2013 spring should be a very good one, but for now Rocco will be the quarterback. The Cavaliers return two talented running backs in Perry Jones and Kevin Parks, and their offensive line returns three starters that I believe have NFL futures. The Cavaliers don’t have much experience at wide receiver, but returning receiving leader Tim Smith is poised for a break-out season, as is Darius Jennings, a true sophomore wide receiver with plenty of speed. The Cavaliers should have a pretty reliable offense this year, particularly if Rocco continues to improve and some of his relative unknown receiving options step up. Michael Rocco, QB*- Rocco is a 6’3”, 225 pound junior who enters this season with 13 career starts that all came as a sophomore. He looked like the obvious choice to be the starting QB, but then Phillip Sims transferred to Virginia from Alabama after losing the starting job to AJ McCarron again. Rocco isn’t a great athlete but he was solid as a starter last year, passing for 2,671 yards (60.7% completion), 13 touchdowns and 12 interceptions. He doesn’t have as strong of an arm as Sims does, though he probably has above average arm strength if I had to approximate, but it’s not ideal. I want to see him improve as a decision maker this year, which could very well happen given how often he is praised for his football IQ and intangibles. He’s tough and he’s an effective leader even if he isn’t a big “rah-rah” guy, and that could be what helps him keep his job more than anything else. It will be interesting to see how he does this season, because keeping a hold on his starting job will require improving on the field and some mental toughness off of it. Sims isn’t going to go away, and he will be nipping at his heels all season in all likelihood. Rocco should be named the starter even if he isn’t as physically gifted because he knows the offense so well and Sims is still playing catch-up in that regard. Phillip Sims, QB**- Sims is the talented but often overlooked quarterback that is likely to back Rocco up this season. Sims was AJ McCarron’s back-up at Alabama and could never overtake him to win the job, and transferred to Virginia hoping to unseat Rocco and start here. That seems unlikely even though he gained a medical hardship waiver enabling him to play right away. That meant he was in a stiff competition for playing time with the entrenched starting quarterback without having a firm grasp of the offense. Sims doesn’t have the playbook mastered yet, and even though it is similar to the offense he ran at Alabama it will take him time to master the terminology that Rocco is already fluent in. Sims likely won’t unseat Rocco for the starting job now, but down the line once they are both more comfortable Sims could have a chance to do so. Sims is listed at 6’2”, 217 pounds and I believe he is only a redshirt sophomore. That means that even if Rocco holds him off until he graduates Sims should have a season to start as a senior unless Rocco leaves early or he manages to overtake him before he graduates. It should be an intriguing developing story because Sims has a lot of natural talent, he’s just not as advanced as Rocco is in the mental aspect of the game, particularly as it pertains to UVA’s offense. Perry Jones, RB- Jones is returning for his senior year with the Cavaliers having started 24 games in his career. He’s listed at 5’8”, 185 pounds but is pretty filled out considering his small frame. He is everywhere on Virginia’s offense, rushing 184 times for 915 yards and 5 touchdowns (5.0 ypc) and catching 38 passes for 506 yards and 3 touchdowns as a junior. Jones may be a smaller back but he runs hard and with authority, doesn’t back down from contact, and has plenty of shiftiness and quickness as a runner. He doesn’t have gamebreaking straight line speed, and he may not have the frame to take a consistent pounding as a feature back at the next level, but his ability to run the ball effectively as well as catch the ball out of the backfield should result in him being drafted in the 5th-6th round range if not higher next April. Kevin Parks, RB**- Parks may only be a sophomore but he’s got plenty of upside and will likely be the feature back after Jones graduates. He’s a shorter back like Jones as he is listed at 5’8”, but he weighs just shy of 200 pounds, and is listed at 195. That’s a lot of muscle to pack onto that short frame, and he almost reminds me of Doug Martin in that respect (aka, the Muscle Hampster). Predictably Parks runs hard, can’t be taken down by arm tackles, has some burst to hit the hole and has good leg drive. He isn’t on Jones’ level as a receiver out of the backfield, catching just 11 passes for 82 yards and 1 touchdown as a freshman, but I would be surprised if he didn’t improve in that regard. He’s got a lot of ability and despite playing second fiddle to Jones last year he rushed for 709 yards and 9 touchdowns (4.7 ypc). He may not be the starter yet, but he’s going to get plenty of touches this year and will almost certainly be the go-to guy at running back in 2013. Tim Smith, WR*- Smith is the top returning receiver coming back for the Cavaliers and is primed and ready for a break-out season if he can stay healthy. He lost the 2010 season to injury when he had to have reconstructive ankle surgery, and despite not being 100% last season from being “nicked up” he was far and away the best deep threat the Cavaliers had on their roster. He caught 33 balls for 565 yards and 3 touchdowns, averaging 17.1 yards per reception. He’s listed at 6’0”, 185 pounds and has plenty of speed to threaten teams vertically and has a 4.4 speed in the 40 yard dash. His sophomore season was just the beginning of his production and he is ready to make even more big plays this season. He has assumed a significant leadership role with the wide receivers because he is the most experienced of the entire lot, and has been pushing and motivating them all to get better. He is committed to improving and his goal is to get 1,000 yards and 10 touchdowns this season even though only two Virginia receivers have eclipsed 1,000 yards receiving since 1990. He was actually high school teammates with Phillip Sims which provides an interesting dynamic for the quarterback competition that I imagine will be ongoing. Smith works hard, watches a lot of film and has become a leader all of which I love to hear. Now he just has to stay healthy and he should break out this season. Darius Jennings, WR**- Jennings is a 5’11”, 165 pound receiver who is entering his true sophomore season but he has explosive speed much like Smith does. He had 20 receptions for 238 yards and 1 touchdown as a sophomore, but his biggest game came against Miami when he caught two screen passes but turned them into 78 combined yards and his only touchdown of the season. He’s dangerous in the open field and was utilized as the team’s primary kick returner last year, totaling a 20 yard average on his 30 runbacks. He seems poised to step up as well, and has reportedly been learning a lot from the leader of the receivers Tim Smith. He isn’t very big like Smith and he has plenty of speed and burst, so look out for them to turn a lot of short receptions into big gains thanks to their ability to generate yards after the catch. Colter Phillips, TE- Phillips has 26 career starts but despite that he has never been much of a receiving threat, and he only had 3 receptions for 15 yards as a junior. He looked like he was ready to step up as a sophomore though, as he caught 18 receptions for 155 yards and 3 touchdowns. It remains to be seen how much of a role he will play in the passing attack this season, but hopefully he will be more involved. He is listed at 6’6”, 245 pounds and has the athletic ability and hands to be a productive tight end, he just needs to stay on the field. Oday Aboushi, OT- Aboushi is the top draft prospect on Virginia’s roster right now and he has a legitimate shot at being a 1st round pick if he continues to improve as a senior. He enters his senior season with 25 career starts (20 coming at left tackle) and has prototypical left tackle size at 6’6”, 310 pounds and has the athleticism to stick at the position in the NFL. He is a hard worker and continues to improve, but he isn’t a very good run blocker at this point. That won’t deter teams from drafting him if he shows he can be a quality starting left tackle at the next level, but if teams are wishy washy about him sticking there or moving back to right tackle then his less impressive run blocking will drag his overall grade down. It will be interesting to see how he does as a senior because he is one of the top senior offensive tackles in the country. Morgan Moses, OT*- Moses is a mountain of a man who enters his junior season with 20 career starts including 19 at Right Tackle (the other at right guard). He seems like a prototypical right tackle in the NFL to me, and is listed at 6’6”, 335 pounds and after reportedly weighing 350 pounds last season. He has surprisingly good feet and I think he can stay on the outside at the next level based on what I’ve seen so far. I’m not quite convinced he can be a left tackle in the NFL though. However, after Aboushi graduates if Moses doesn’t declare early he will likely slide over to left tackle as a senior like he did while Aboushi missed spring practice this season. Moses is very talented and has a lot of potential and is a potential 1st round pick in his own right, and forms one of the best offensive tackle combos in the entire country. Luke Bowanko, OG*- Bowanko is returning for his second full season as a starter after starting all 13 games at right guard as a sophomore. He’s listed at 6’6”, 295 pounds and figures to get even bigger as he continues to fill out his frame. Bowanko has impressive speed and movement skills for an offensive lineman and reportedly ran a 4.8 40 yard dash when he was a junior in high school. Not only is he skilled on the football field but he works hard in the classroom and chose Virginia largely because of academics. He seems like a great kid and he’s an easy guy to root for, and I’m excited to see how he plays this year. This offensive line returns three starters and all three have NFL futures. Bowanko might be under the radar right now, but he won’t stay that way for long. Bill Schautz, DE- Schautz is a high effort defensive end who has some injury question marks. He broke his leg in two places last season against Florida State and spent the entire offseason rehabbing to try to come back for the season. He is supposedly 100% now, and that is a tribute to his impressive work ethic and determination. He’s a senior now and if he can stay healthy for the entire season he could easily surpass his last season totals of 28 tackles, 4.5 TFL, 2 sacks and 2 pass break-ups. He’s got a great motor and always plays with great intensity, and has reportedly taken the top recruit in the state of Virginia, Eli Harold, under his wing. The two are roommates and if Harold, who has been timed at 4.46 in the 40 yard dash, begins to emulate Schautz’ work ethic and motor the sky will be the limit for him. There’s no word on whether Harold will play this season or not, but even if he doesn’t the lessons he will learn from Schautz will be valuable. He’s a key cog on the Cavaliers defense and while he might not be more than a late rounder or undrafted free agent at this point his leadership and work ethic will prove valuable if he does get a shot at the NFL. Will Hill, DT- Hill is returning for his senior year with the Cavaliers and the defensive tackle has been named a team captain for the 2012 season. He is listed at 6’4”, 280 pounds and despite only having 1 career start he returns as a starting defensive tackle and a leader at that. Last season he had 36 tackles, 6 TFL, 1 sack, 2 pass break-ups and 1 forced fumble. I think he is ready to surpass all of those totals as a senior. He’s a bit undersized and could stand to add some more weight to fill out his frame, but he’s flying way under the radar since he has so little starting and playing experience beyond last season. He’s flashed some hand usage thus far in his career, but if he can continue to improve his hand usage and get more violent to shed blocks quicker and more decisively he would make more impact plays. He’s got a good motor and work ethic, so I think he’s capable of those improvements. If he can step up it would really help Virginia’s defense as a whole, both in run defense and in pass defense. Steve Greer, MLB- Greer might be the top prospect on Virginia’s defense. He is listed at 6’2”, 225 pounds and he led the team in tackles last season with 103 tackles, 4 TFL, 2 sacks and 4 pass break-ups. He has 24 career starts as he started as a freshman and as a junior, but lost his starting job as a sophomore despite playing in every game. He’s going to be the starter in the middle again this year, and figures to be one of the leaders of the defense along with Will Hill and Bill Schautz and was named a team captain for the 2012 season. He’s a tough player that doesn’t have great range though, and even though he’s a good tackler he is relatively unproven in coverage. He has some work to do to get drafted, but he’s got the attitude and work ethic to make a NFL roster even if he doesn’t get drafted. LaRoy Reynolds, OLB- Reynolds was the second leading tackler on the Cavaliers last season with 88 tackles, 8 TFL and 1 pass break-up as a junior. He’s listed at 6’2”, 230 pounds and has been named a captain for the 2012 season. He’s not quite as fundamentally sound as Greer is as a tackler, but he has more explosiveness as a hitter and is no stranger to aggressive take-downs. He’s a little more physically imposing despite their similar measurables, but he tackles high more than I would like which can lead to missed tackles if it isn’t corrected. He contributes on special teams as well which should help him make a NFL roster even if he doesn’t get drafted. Demetrious Nicholson, CB**- Nicholson started 13 games last year as a true freshman and is the only returning starter in the secondary for the Cavaliers which is going to be a serious concern for their defense this season. The pressure is squarely on the front 7 to make things as easy as possible for the secondary as they start not one, not two, not three but FOUR sophomores including three true sophomores in their defensive backfield. Nicholson is easily the most proven commodity having started last season as a true freshman as he earned 2nd team freshman All-American honors as he totaled 60 tackles, 2 TFL, 8 pass deflections and 2 interceptions. He is the only defender returning with an interception in 2011 and is going to be under intense pressure. Even if he steps up and plays well teams will just avoid him and challenge the other unproven members of the Cavalier secondary. Nicholson is listed at 5’11” but only weighs 165 pounds, so durability may be a concern for him until he can fill out his frame, but he has plenty of talent. Today I am previewing the Duke Blue Devils. We all know the Duke Football program has had it’s struggles, and David Cutcliffe and his staff are still searching for a bowl appearance. They’re hoping that 2012 is the year, but I’m not sure it will be right now. They return a 3rd year starter in Sean Renfree at QB which is certainly encouraging, but he hasn’t ever had a very reliable run game to support him and that led to him throwing 434 passes for only 2,891 yards last season. The offensive line should be a solid but unspectacular group, and if they can help Desmond Scott and Juwan Thompson run the ball more effectively it should pay dividends for Renfree and the passing game. That would certainly please Conner Vernon as he attempts to chase ACC records as a wide receiver. The offense should be solid but not spectacular, but the real question mark is the defense. Sean Renfree, QB- Renfree is a 6’5”, 230 pound quarterback who returns for his 3rd season as the Blue Devils’ starting quarterback with 23 career starts. Last season he didn’t exactly blow the doors off the ACC as he passed for 2,891 yards, completed 65% of his 434 attempts and threw 14 touchdowns and 11 interceptions. It’s a positive trend from his first season as a starter as far as efficiency (18 TD’s, 19 INTs and 62% completion) but he threw for 570 less yards as a junior. He’s not a top prospect, but his combination of size, arm strength and football IQ will make him an attractive developmental prospect. I think Renfree is a near guarantee to get an invite to the East-West Shrine Game, and if that happens I will very much be looking forward to seeing him in person. If I’m lucky I’ll be at the Duke-UNC game this year to see him play well before that. Renfree is a draftable player, so it will be interesting to see how much he can boost his stock as a senior. Desmond Scott, RB- Scott is a smaller, speedier back who is listed at 5’9”, 190 pounds. I wouldn’t normally have a problem with that frame since he has a respectable amount of weight packed onto it, but Scott has had a lot of issues staying healthy and durable throughout his career at Duke. He’s a talented back with plenty of speed and burst, and he catches the ball well out of the backfield, but unless he can stay healthy this year he won’t get drafted. Juwan Thompson, RB*- Thompson filled in quite well for Scott while he was injured last season, rushing 110 times for 457 yards and 7 touchdowns as a sophomore. Thompson is a very different back than Scott, as he is listed at 5’11” and tips the scales at 230 pounds. He’s the thunder to Scott’s lightning, and I’m interested to see him play more this season. He really stepped up for them as a sophomore, so hopefully he can build on that as a junior. Conner Vernon, WR- Vernon has been Duke’s most reliable pass catcher for what feels like forever, and now he enters his senior season with 32 career starts and is coming off a 70 catch, 956 yard, 6 touchdown season as a junior. He’s Renfree’s top target without a doubt, and runs good routes despite his lack of elite burst or acceleration. He has very reliable hands and catches the ball well outside of his frame which is critical for any receiver in my opinion. He’s a very fundamentally sound player, and while he won’t blow you away with his 40 yard dash time or any of his measurables he will come to play and offer a reliable pair of hands for anyone who throws a ball his way. That might not get him drafted very early, or perhaps even at all, but I think he will make a NFL roster. Laken Tomlininson, OG**- Tomlinson is one of Duke’s best offensive linemen if he isn’t already the best. He’s young, and is entering his redshirt sophomore season this year, but the 6’3”, 315 pound right guard has plenty of upside. He’s nasty and aggressive which I love, but he is still raw and needs to improve his hand placement and his overall technique at this point. He’s got the upside though, so it will be interesting to see how well he takes coaching because if he works hard he could improve a lot and be one of the highest draft picks Duke has had in two decades. Takoby Cofield, OT**- I know nothing about Cofield other than the fact that he is listed at 6’4”, 310 pounds, he started 2 games at left tackle as a redshirt freshman, and his name is actually Takoby. Kenny Anunike, DE- Anunike is a converted tight end and despite getting a medical redshirt after starting only 3 games last season he still led the team in sacks with 4. That should paint the picture of how desperate Duke is for a pass rush, and that’s why Anunike coming back healthy is so critical for them. If he can stay healthy for the entire year he could turn his raw athleticism into 6-8 sacks or maybe even more if he’s worked on his technique. 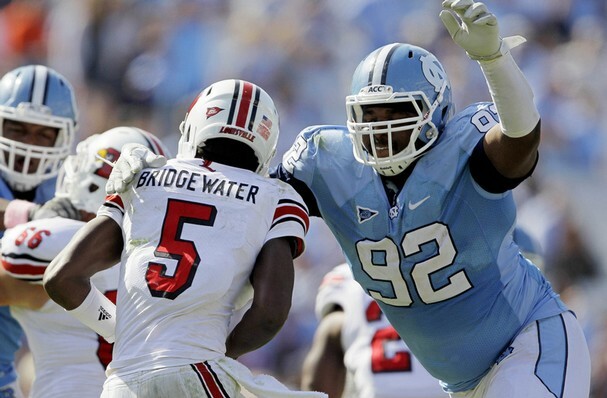 He’s listed at 6’5”, 255 pounds and if he stays healthy this year he has a chance to get drafted. Whether he does or not depends on how well his knee injury has healed and whether he is still just an athlete playing defensive end or a defensive end with a lot of athletic ability. Kelby Brown, OLB*- Brown is one of Duke’s best defenders and it showed as he had 65 tackles, 5.5 TFL, 1.5 sacks and 3 pass break-ups as a sophomore. He injured the ACL in his right knee on November 20th against Georgia Tech but reinjured the knee again in Februrary. I’m not sure what his status is for this upcoming season, but I think the best choice would be to sit out the year or to take a medical redshirt. He is just now 6 months removed from the injury and that’s definitely not enough time to recover from an injury that severe, especially since he reinjured it just a couple months after the original surgery. We’ll see if he plays this year, but if he does he absolutely won’t be at 100%. Ross Cockrell, CB*- Cockrell is Duke’s best cover corner and is likely their top returning defensive back overall. Cockrell is listed at 6’0”, 180 pounds and has 4.5-4.55 speed according to the listing I found, but he has quality ball skills. As a redshirt freshman he totaled 7 pass break-ups and 3 interceptions and followed that up with 56 tackles, 1 TFL, 9 pass break-ups and 1 more interception as a sophomore. Now he is entering his junior season and while he may not be an athletic freak I think he has some potential as a NFL corner. He has to add weight in my opinion and work on his technique, but he has some fairly intriguing tools. Today I am previewing the Georgia Tech Yellow Jackets. The Yellow Jackets are poised for another productive year running the football with their triple option offense, and with an experienced and deep offensive line returning they have a chance to lead the nation in rushing yardage. They are waiting for a receiver or two to emerge, but as usual they have one or two ready to step up and stretch the field when the team wants or needs to pass. Tevin Washington, Orwin Smith and David Sims are the heart of the running game, and the offensive line is led by Omoregie Uzzi, Jay Finch and Will Jackson. Tevin Washington, QB- Most people are familiar with Washington as he is the face of Georgia Tech’s vaunted triple option offense, and consequently he carries the ball the most since he touches it on every play. Last season he passed just 150 times, completing 74 passes for 1,652 yards, 11 touchdowns and 8 interceptions. He ran the ball 92 times more than he threw it, rushing 242 times for 986 yards and 11 touchdowns (4.1 ypc). This year the 6’1”, 205 pound quarterback/ball carrier enters his senior season and it will be interesting to see what he can produce. He’s obviously not a NFL quarterback, but he figures to get some attention as a running back prospect. The obvious problem with that is that he will have to get used to being handed the ball rather than touching it on every snap, but his experience reading keys and deciding whether to keep the ball or hand it off should help him transition to reading holes as a running back. It’s a tough transition, and it’s hard on evaluators, and that likely won’t help Washington’s case. I don’t know where to project him as a prospect right now, but gun to my head I’d say he’s a late round guy at this point. Orwin Smith, RB- Smith is entering his senior season and he is coming off of a productive season, totaling 615 yards and 11 touchdowns on just 61 carries in addition to 13 receptions, 306 yards and another touchdown. Smith’s touches were limited, but his impact wasn’t. Now he is in his final season with the Yellow Jackets and he is being assessed for how well he transitions to the NFL. The problem is that all of those big plays are produced because of the scheme, not because he is a Reggie Bush/Barry Sanders caliber athlete. He is in the 4.5 range, and while that is respectable for a 6’0”, 202 pound running back it doesn’t quite line up with his 10.1 ypc average or his 23.5 average yards per reception. He contributes on kick-offs as well which helps him, but right now he’s a late round guy that is productive as a result of the scheme he plays in, and that’s going to be a tough designation to shake. David Sims, RB*- Sims has a little bit of an easier time being projected to the NFL as he is playing the “B-Back” position that Jonathan Dwyer and Anthony Allen both parlayed into shots at the NFL while Smith plays the “A-Back” position which doesn’t transition as well. The B-Back is lined up directly behind the quarterback on a typical play, and will get the ball handed to him on the first read the quarterback is asked to make. Therefore, while it is a simple play and he doesn’t usually have to do a lot of reading of the defense, he is at least used to getting hand-offs, finding room to run and running with good pad level between the tackles. That makes the transition to the NFL easier, and Sims has a shot at the NFL. He’s listed at 6’0”, 218 pounds and has a listed 40 yard dash time in the 4.5’s (4.59 currently) but he has some potential as a power back. He was new to the position last year, so it will be interesting to see what damage he can do in his second year starting at the B-back spot. Jeff Greene, WR**- Greene is the next receiver in line who is expected to take the nation by surprise with his combination of size, length and athletic ability. He didn’t have a single catch last year, but at 6’4”, 200 pounds and with 12 games of experience playing, even if he went without a catch, he is poised to break-out this year now that Stephen Hill has moved on to the NFL. He may not run a sub 4.4 like Hill did, but the coaching staff is excited about his upside and they expect a lot from him. He could very well lead GT in receiving this year despite not having a single catch a year ago. Only at Georgia Tech. Jeremy Moore, WR*- Moore is even more under the radar than his teammate Green is, but he is listed at 6’3”, 180 pounds and while he wasn’t penciled into the starting line-up in the spring he fought his way up to a starting position and impressed the coaches. His former teammate Tyler Melton (take note, people who have first names that start with T and the last name Melton tend to be exceedingly brilliant) has said that he expects “Jeremy to be the surprise of the year” this season for Georgia Tech. That’s high praise, but according to Melton he has the speed, quickness and hands capable of surprising people this year. Most notably he said that he “doesn’t body catch. He snags everything out of the air.” That’s huge, especially for playing in this offense, because being able to catch less than accurate passes from triple-option quarterbacks means you have a bigger catch radius for them to throw to. That means more possible receptions, and those are few and far between in this run-first offense. Keep an eye on Moore, he has had trouble with injuries at Georgia Tech but I’m excited that he is finally getting his shot. Ray Beno, OT*- Beno is the left tackle on the Yellow Jackets and he returns for his junior season with 12 career starts, all at left tackle, but according to Phil Steele he has experience playing at every spot along the offensive line. I was wondering if I should mention him or not, but that kind of versatility is quite rare and NFL teams are sure to take notice of that even if he doesn’t grade out as much more than a late rounder. At 6’2”, 290 pounds Beno is almost certainly going to be an interior lineman in the NFL but the versatility to play all over the offensive line is extremely important. I haven’t watched him before, but keep an eye on him over the next two years. Omoregie Uzzi, OG- Uzzi may be the top NFL prospect on the Yellow Jackets right now, and I think he’s going to be considered a top 50 pick by the time the season is over. He has 24 career starts, all at right guard, and will be playing right guard again this season. He’s listed at 6’3”, 300 pounds and is a quality run blocker that is a natural knee bender, plays with good pad level and has some nastiness to him as well as a strong initial punch. I haven’t seen him much in pass protection, but then again that is bound to happen given the nature of Georgia Tech’s offense. His run blocking will garner him plenty of attention though, and if he can show some ability as a pass blocker his stock won’t dip out of the 2nd round. Will Jackson, OG*- Jackson is a 6’3”, 285 pound junior who has 22 career starts all at left guard for the Yellow Jackets. He’s not a top prospect as of right now, but he’s a solid contributor who is someone to keep an eye on. He was a 1st team Freshman All American when he started 9 games as a freshman, and he returns to an experienced group as a junior. He isn’t the most physically imposing kid, but he’s tough and experienced. That will only become more evident as he continues to start more games, and he could realistically leave Georgia Tech with close to 50 starts by the end of his senior year. Jay Finch, C*- Finch is the so-called “anchor” of the offensive line and returns for his junior season with 15 career starts, 12 of them at Center. He’s considered to have quality leadership, though I haven’t seen enough of him to know how often he makes line calls and adjustments to blocking schemes pre-snap. He’s considered to be a good athlete with plenty of quickness and good footwork. I haven’t seen much of him up to this point, but I’m expecting him to impress me this year as he has been named to the Rimington Watch List for the top center in the country. Izaan Cross, DE- Cross is a 6’4”, 292 pound senior defensive end in Al Groh’s 3-4 defensive scheme. He returns for his senior season with plenty of experience in the form of 28 career starts, but he wasn’t as effective as some expected last year when he totaled 32 tackles, 1 TFL, 1 forced fumble and 4 pass deflections. The previous year he had 41 tackles, 5 TFL and 2.5 sacks, 1 forced fumble and four pass break-ups. It’s worth considering that in a 3-4 scheme like Groh’s the defensive line is expected to occupy blockers so that the linebackers can fill the gaps and stuff the run by tackling ball carriers in the gaps or forcing runs to be strung out towards the sidelines, so the defensive ends aren’t expected to be extremely productive on the stat line. Still, the dip in production was noticeable and it will be interesting to see how Cross does this year. I’m not that familiar with his game yet, so I’m interested to see whether he projects better to a 3-4 at DE or whether he might be better if he can penetrate upfield as a defensive tackle in a 4-3. TJ Barnes, DT- Barnes is a gargantuan defensive tackle who will play nose tackle in Georgia Tech’s 3-4 defense this season. He was highly touted coming out of high school and during his redshirt year he wreaked consistent havoc playing on the scout team, causing coaches to salivate at his potential. He hasn’t lived up to it yet, however, and this season is his last shot. He returns for his senior season with just 3 career starts and despite playing in 13 games last season he only registered 11 tackles, 0.5 TFL and 1 sack. His conditioning has been a problem the past three years, but this year the 6’7”, 347 pound nose tackle is supposed to be in significantly better shape coming into this season. He spent extra time doing cardio and other conditioning workouts to get in better shape. It appears to be working, as offensive guard Will Jackson has claimed that Barnes is much quicker and more explosive off the ball. He’s got all the size and strength you could ask for in a nose tackle, particularly in a 3-4 defense, and if he has improved his conditioning enough he could be a very disruptive force for Georgia Tech this season. The problem with evaluating him will be evaluating if the light turned on just in time to boost his draft stock and his pay check, or whether the light came on and he is ready to potentially dominate as he gets in better shape and improves his hand usage and technique even more. I tend to shy away from one year wonders, but first Barnes has to have that one-year wonder season before we can try to determine whether it was a flash in the pan or not. Here’s hoping he has a great year and proves to be a dominant force in the middle of the Yellow Jacket defense. Jeremiah Attaochu, OLB*- If Uzzi is the top prospect on Georgia Tech then Attaochu is a close second. The 6’3”, 235 pound outside linebacker possesses impressive athleticism, change of direction burst and edge speed to threaten offensive tackles off the edge. My problem with his game is his struggles once he is engaged. Like many talented edge rushers with impressive athleticism he has been able to get by on his athleticism alone, and hasn’t needed to bulk up to fight off blockers once he is engaged. He’s not a complete pass rusher yet, but he has the tools and skill set to be if he gets stronger, improves his hand usage and works to disengage from blockers better. He reminds me a little bit of the junior version of Von Miller, a talented speed rusher who wasn’t a complete defensive end/linebacker yet. But after he got a little stronger and improved his technique he ended up being the #2 overall pick in the draft. Attaochu may not be on Miller’s level, it’s too early to tell, but his athleticism is pretty rare and if his technique, functional strength and football IQ catches up with his athletic ability he’s going to be a very valuable commodity come draft time. Quayshawn Nealy, OLB**- Nealy is a redshirt sophomore linebacker who the Georgia Tech coaches seem to be very excited about, particularly defensive coordinator Al Groh. Nealy has been spending a lot of time with Groh to help absorb the intricacies of the 3-4 defense better. He also added about 10 pounds of weight and is supposedly playing at about 235 pounds even though he is listed at just 6’1”, 223 pounds right now. Nealy has impressive athleticism, has been developing as a leader and I think he might be moving to one of the inside linebacker positions for the Yellow Jackets this season. I’ve read about him playing outside and also inside, so we will just have to wait and see on that front. Regardless, Nealy made the most of his appearances last season, including 7 starts, as he made 52 tackles, 3 TFL, broke up 3 passes and had 2 interceptions, one of which was returned for a touchdown in Georgia Tech’s bowl game last season. He’s got a lot of ability, and as the game slows down for him and he continues to fill out he has the potential to be a special player, particularly if he keeps absorbing as much of Groh’s defensive knowledge as he has already. Rod Sweeting, CB- Sweeting is returning for his senior season with only 13 career starts but considerable playing experience while not designated as a starter. He had 7 pass break-ups and an interception as a sophomore in 13 games, and then started 13 games as a junior and totaled 56 tackles, 3 TFL, 10 pass break-ups and 3 interceptions. He’s not the biggest corner despite being listed at 6’0”, 184 pounds and could stand to add more weight to his tall frame. He’s a good athlete though, and most importantly he has smooth hips and transitions well when changing directions. As evidenced by his statistics as well as his play, he has quality ball skills and that is something that is incredibly important for defensive backs because I’m not convinced it can be coached up very well. You either have those skills or you don’t, and Sweeting has them. He’s a mid-round guy right now, but if he has a consistent senior season he could crack the top 100 selections in April. I expect him to be at the Senior Bowl or East-West Shrine Game this winter. Louis Young, CB*- Young is another tall corner, listed at 6’1”, but weighs 201 pounds and is much more filled out than Sweeting is right now. He may be more physically gifted, but he doesn’t have as much playing experience as Sweeting does and it shows. Young has shown he is no stranger to contact though, and seems to enjoy tackling which evaluators will love to see. He seems to mirror receivers well and has impressive quickness too. He is supposedly a very hard worker on and off the field and if he continues to work that hard it’s almost a virtual certainty that his play on the field will continue to improve exponentially. Now that he has a full season as a starter under his belt (12 starts, he was suspended for the bowl game for a violation of team rules) Young figures to improve on his 52 tackles, 3 TFL, 5 pass break-ups and 1 interception stat-line from his sophomore year. He has a lot of upside, so it is going to be fun to watch this secondary this season. Isaiah Johnson, FS*- Johnson is a junior this season yet he returns with 16 starts to his name. He started all 13 games last season and was second on the team in tackles with 78 and also had 2 TFL, 1 sack, 3 pass break-ups and 3 interceptions to boot. He seems to have taken on a bit of a leadership role on the defense, and I’m excited to see the 6’2”, 205 pound center play more this season. I think he has a lot of potential.